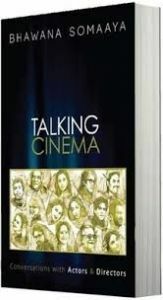 Talking Cinema: Conversations With Actors & Directors, published in 2013, takes a look into the reel lives of film personalities. This book tries to answer questions about how actors prepare themselves for specific roles, and what is their intellectual and emotional state of mind. The author has documented conversations with some of the film industry's most famous stars. It provides an insider's view and insight, and makes readers understand that movies are beyond designer clothes, makeup and glycerine teardrops. Talking Cinema: Conversations With Actors & Directors is divided into four sections. An Actor Prepares focuses on how a performer readies himself or herself for a role. Character Speak is the second section, and takes a look at the research that has gone into developing some of the most critically acclaimed characters that have appeared on Indian movie screens. The next portion of this book shifts its focus away from the performers, and deals with filmmakers. Directors Cut takes a peek into the mind of such personalities. The Specialists is the final section of Talking Cinema: Conversations With Actors & Directors. The author tries to analyze why a director or actor associate themselves with a particular genre of films or characters. Further, readers have the opportunity to figure out how similar or dissimilar these roles or themes really are. Talking Cinema: Conversations With Actors & Directors introduces readers to the efforts and skills that are required in order to make a movie. Bhawana Somaaya is an Indian film critic, columnist, journalist, designer, and writer. She has written Cinema: Images & Issues, Salaam Bollywood, Hema Malini: Authorized Biography, and many other books revolving around cinema. She has done a trilogy on Amitabh Bachchan, which includes The Legend, Bachchanalia, and Amitabh Lexicon. Somaaya started her career as the Chief Reporter of Cinema Journal, and then became a Special Correspondent for Super. She later joined Movie, and became its Joint Editor. In 2012, the author was made the Editor Chief of Screen Magazine of The Indian Express. She has also been a member of the Central Board of Film Certificate's Advisory Panel. She has written articles for The Hindu, Sandesh, The Observer, The Hindustan Times, The Indian Express North American Edition, and many other newspapers and magazines. Somaaya has also designed outfits for Shabana Azmi in movies like Kamyaab, Masoom, and Bhavna. The author is currently Radio Channel 92.7 BIG FM's Film Expert and also does reviews of films for BBC Online.